35mm Slide scanning and prints from 35mm slides. 35mm slide scanning to digital picture files on CD or USB drive. The pictures stored on your 35mm slides will come to life again when we scan them to high quality digital picture files. You, your parents, or grandparents, spent a lifetime collecting their memories on slides so don't let them fade away. 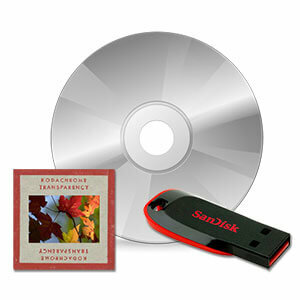 We can save your slide scans on CD or USB drive for easy viewing and printing at a very reasonable price. And with our quantity discounts, the more you slides you have printed or scanned, the more you save. We can save your scanned slides to a CD, DVD or a USB flash drive if you prefer, or we can upload the scans to Dropbox. If you would like to supply your own USB drive please bring it in along with your slides. We scan your 35mm slides locally in our lab in Kansas, so you won't have to worry about losing your slides. 35mm slide scanning to CD, DVD or USB drive. We can upload your slide scans to Dropbox if you prefer. When we scan your 35mm slides we will blow them with compressed air to remove any dust, and then correct the scanned image to give the best color and contrast. Most slide scanning jobs require one business day, but larger projects may require extra time. If you would like we can scan you 35mm slides in order if you provide them to us organized in the order that you would like. 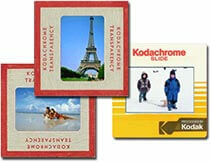 We can scan any type of 35mm slide including Kodachrome, Ektachrome, Fujichrome and many more.